This month we had the awesome opportunity to sit down with Steve Dee of Tin Star Games. 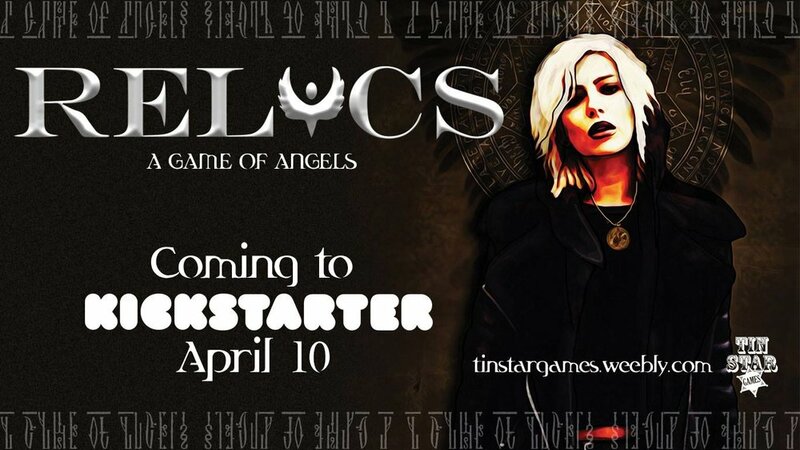 Thank you so much for taking the time to talk with us about your upcoming RPG on Kickstarter, Relics: A Game of Angels - So, one of the first things with any game creator we feature is that we point out how almost all of them were gamers before. So what got you into RPG gaming? I got into roleplaying when I was about eleven years old. I'd played a lot of Talisman and discovered a box that looked similar on the game store shelf: it was what they call the D&D redbook, the Basic edition from the BECMI/Rules Cyclopedia set. I fought Bargle and mourned Aleena as so many others did; I was hooked from the get-go. As a game creator now this is not your first project, in fact you've been involved in a few different properties; what has been your most personally satisfying projects to date before this one? Relics: A Game of Angels uses an alternate method for determining risk and success; namely a tarot deck. What inspired you to move away from dice for this game? The game actually uses the system seen in James Wallis' Alas Vegas. It also uses tarot to wire in its theme of luck of the draw and the card tables of the casinos. The flashback system it uses was a great fit for Relics and the cards fit too - angels appear often in the tarot. It seemed a perfect fit. You've teamed with another big player in the indie RPG business, Ben Scerri, for this game. What was it like working with him? Ben has been a fan of my work for years, which was always a great inspiration for me to keep working. When he started making his own games I worked on some of them, so it was great to bring him in on this too. He's very talented and a true professional. So, with Relics: A Game of Angels what would you say are your primary influences for the games creation and genre? Relics has lots of influences, some of them very obvious. In Nomine, the SJ Games RPG, is a big one that everyone spots, but what I'll do is mention some of the less obvious ones. Warhammer, Paranoia, Underground, Blue Planet and Starchildren were all really important to me over my gaming history. Those were all games that taught me that RPGs could also be about really big ideas and ask big questions, and delve into political and philosophical issues. Relics is fundamentally a philosophical work and it wouldn't be that without those games. When it comes to media inspirations, again, there's obvious ones. Vertigo comics like Sandman, Lucifer and Constantine. The Prophecy films. But again, a less obvious one was I grew up on a Christian homily TV series called Highway to Heaven which got me obsessed about angels. Lastly, of course, the shameless plug point: when are you expecting to take this to Kickstarter and is there any place that fans could go to look at this product or any of your other works? We can’t wait to see this game hit Kickstarter and really recommend checking out the Quickstart online!